Have a wonderful and safe 4th, Nanette. Someday I am going to make your Flag pattern. Now how many years have I been saying that!! Stay safe and enjoy your Holiday. Just for you, did it! Mrs. Holiday sounds like a wonderful title. I need a name like that, right now it's Mrs. Procrastinating. Too bad about the fireworks, if it doesn't rain here soon, I'm going to confiscate fireworks hidden in the garage. Enjoy your day anyway! i'm making peanut butter cookies, today, for the family. not really for the 4th, just want them LOL. happy 4th! Love that quilt flag!! Wow!! I will go on over and vote for your pal! I am making apricot pie, corn salad, and tri tip. Can't wait to see what else is on the table when the others get here! Happy 4th! For the 4th, my husband is whisking me away for a 2-day trip to Flagstaff, where the temps are bearable. I am counting the minutes until we leave. Fresh air, here we come! I just voted for Nan. Had no idea there was a Mrs. Holiday contest. I have a stack of Taste of Home magazines in my pantry. I love to just look at the food and recipes. Yum! Happy 4th to you and all your family!!!!!!!! Happy 4th of July Nanette!!! AHHHHH... NOW I want to make this.. and please hurry up with the London quilt.. you are killing me it's so cute! good memories of macaroni salad! Happy 4th to you. 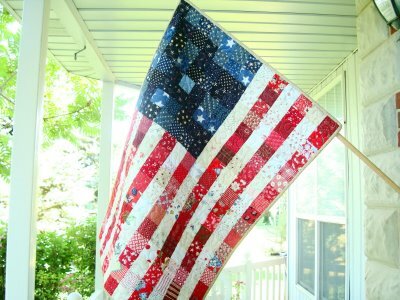 Love your quilted flag! Hope the fire is under control! Good luck!